Folia kubełkowa GXP Plus 20, GXP 20P - GRILTEX Polska sp. z o.o. 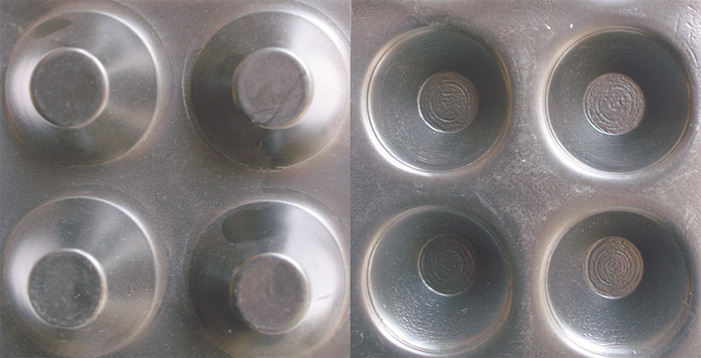 Dimpled foil – very robust drainage geomembrane. Geomembrane made of high density polyethylene (HDPE) 1000 g/m², for mechanical and hydraulic protection of tunnels or other underground structures characterized by significant water flow. Dimpled foil GXP Plus 20 is used as an element of boarding and acts as cover. 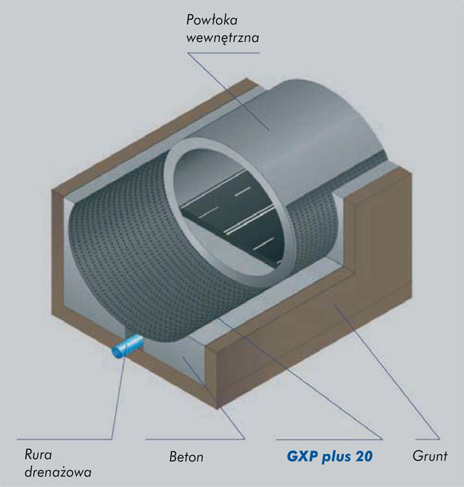 Dimpled foil GXP Plus 20 if installed horizontally limits capillary rise of water into slabs and concrete jointless floors and directs water to drainage pipes (main drain). Bevelled pyramid shape of a dimple means that our geomembrane is very resistant to compression and highly resistant to puncture. Also, high density of dimples 400 per 1 m2 enables uniform distribution of loads caused, e.g. by soil pressure. 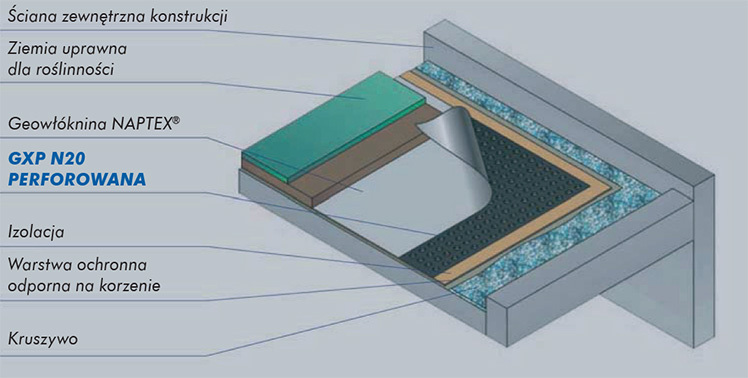 Placing geotextile Typar®SF on dimpled foil creates a significant area and perfect drainage layer on the whole surface. 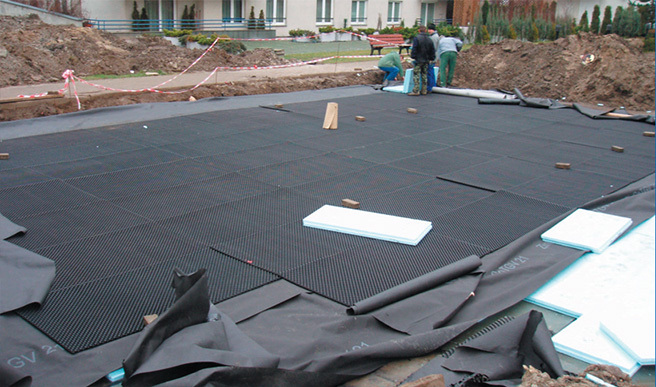 Geomembrane made of high density polyethylene (HDPE) 1000 g/m2, made specially for flat surfaces covered with plants. 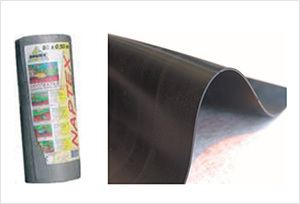 The dimples touch 1 mm thick geomembrane that protects against roots or the active sealing layer. 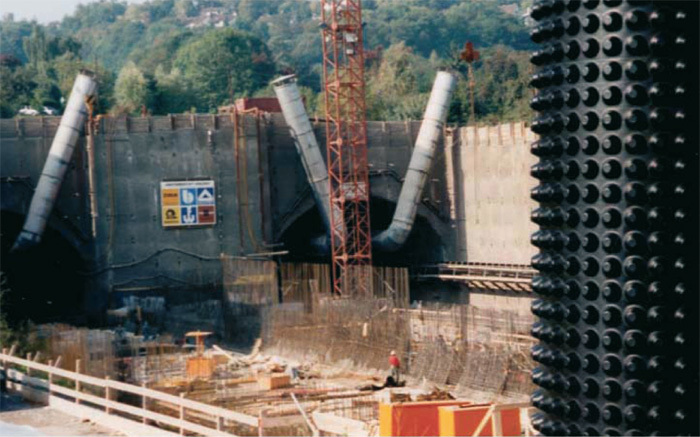 If the dimples are positioned with opening facing up, the concavities act as micro reservoirs regulating the collection of water in the root system (in ground with roots) and increase thermal insulation of the system by reducing the concentration of heat. Excess of rainwater is drained through holes which also guarantees optimum aeration of the system and strengthens the plants. 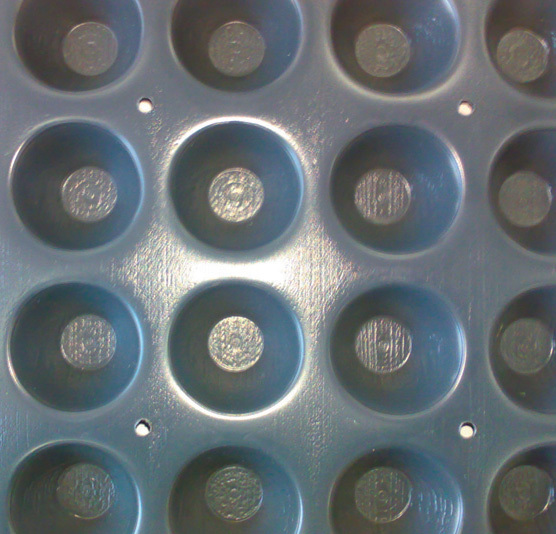 High density of pressing 400 per 1 m2 enables uniform distribution of loads caused by stresses of planted soil. Bevelled pyramid shape of dimples makes PERFORATED geomembrane GXP N20 very compression strength and puncture strength. 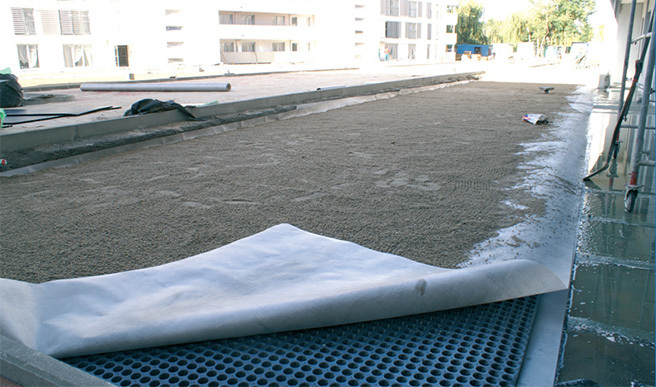 Geotextile Naptex® placed between PERFORATED GXP N20 membrane and planted soil protects it and limits the growth of roots. – More information in Geotextiles. – mm thick, supplied to construction site.